SolGold has just arrived in the mining elite with its new mineral resource estimate at Alpala, which is 2.95 billion tonnes at 0.52% copper, with a 0.2% cutoff. The kicker is the high-grade core of 420 million tonnes at 1.47% copper. Mining Journal caught up with SolGold CEO (and major shareholder) Nick Mather in London this week following the doubling of the resource. Mining Journal: Do you think you're getting taken a lot more seriously with the new MRE? Nick Mather: Yes, it's interesting to note that companies like Newcrest, BHP, undoubtedly others we don't know about, will have have been modelling the results up every time we put them out and they probably had a fair idea what the resource was going to be like well before it came out. I rather suspect that is why BHP decided to move when they did. Importantly the high-grade part of the orebody ... shows the project is indeed very valuable and as the PEA nears completion sometime in Q1 of 2019, I think the efficiencies of scale, the high-grade core, and the spectre of a copper squeeze will deliver some impressive economics. MJ: You've joined the tier one category with this resource. Looking at the other projects in the category, the big one that sticks out is Kamoa-Kakula. Did you learn something by looking at how Robert Friedland sold off half of it for $400 million? NM: We learned that it's not a good idea. All day every day we're interested in wealth creation for our shareholders and not anybody else. The only risk to development in Ecuador on such well-known orebody styles like a massive high-grade copper-gold porphyry would be the sovereign risks. 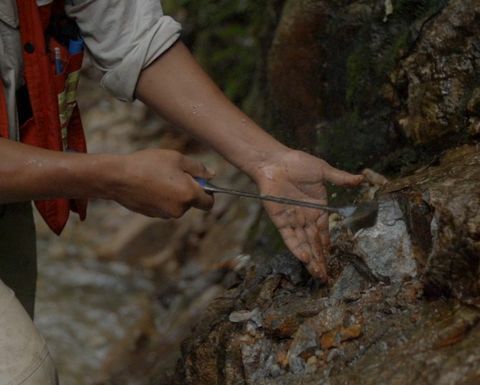 That's something that's being handled sensitively and constructively by the government, and that is obviously encouraging some of the world's largest developers and miners, and they're beating a path to Ecuador's hills. 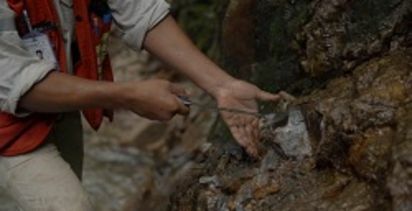 The 23.2 million ounces and 10.9 million tonnes of copper that we've found equates to 85Moz equivalent of gold or 34 billion pounds equivalent of copper, with discovery costs of $1.41 for the gold equivalent or 0.3c per pound for the copper equivalent. Do I want to sell that sort of upside for $400 million? No. And, importantly, we're still educating the financial markets and the investing community about the difference between SolGold and any other junior out there. Other juniors out there are developing a project, if they're lucky enough to have one. We're not doing that, we're developing a province. It's 750km long, it's got four belts in it, it's an underexplored section of the world's richest copper belt province, the Andean copper belt. When we drilled into Alpala in 2012, we asked ourselves the question, 'how likely is it the first one is the only one or the best one'. The answer to that is it's not likely at all. One hundred per cent of [our 11 other targets] have spectacular looking outcrops - 600g/t maximum surface grade at Blanca, 8km from Alpala. That's got potential to deliver $1-2 billion worth of surplus to improve the front end of the Alpala development. MJ: Where are you going to find a drill rig to spare, if you're running 10,000m a month at Alpala? NM: There's probably 10-20% left to find at Alpala. The size and configuration of the orebody is pretty well understood now, from a preliminary economic analysis and prefeasibility ore review. We will be able to relocate some of those rigs to Blanca, and still use the Rocafuerte base for that. We're also relocating some of them down to La Hueca? And our driller's main base is at Hueca, so those projects down there are even closer. He's also a shareholder in the company, he has 38 million shares. We've got as many rigs as we've got prospects, and again, that's a tremendous competitive advantage. When all these other companies get these reconnaissance drill permits, I don't know what they're going to be drilling with. It won't be our rigs. [Driller] Lance Hubbard's got 38 million reasons why he wants to look after us. MJ: Speaking of the neighbours, do you feel a bit claustrophobic surrounded by Hancock and BHP? NM: No, the way we've designed the surface footprint is entirely contained within the tenement. We can't see much room for porphyry mineralisation outside of where we are. That's not to say there won't be anything in the ground. MJ: Has Ecuador's auction system made it hard for you to go for new plots? NM: That is frustrating, and it means our IP gets leaked to the world. Mercifully we got a good head start on everybody. There are lots of other companies like Hancock and Codelco and so on applying nearology and applying around us. We think we've had the best technical basis for the selection of our project areas and we have demonstrated in spades to the government that we will do and are doing what we say we will do. Everyone else has got a long way to catch up. 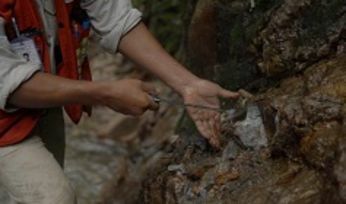 MJ: Looking at the Alpala deposit, have you learned much new about it this year or has it mainly been about turning that inferred resource into indicated? NM: We have learned a lot new about it. Particularly about the way it's trending at depth. It's still got a high-grade core at Alpala north west and Trovinio, and that's sort of plunging down to the north west. We've understood the metal zonations a lot better than we did a year ago, and that's helping us understand more about the targeting, not just within the Cascabel tenement, but within Ecuador generally. That will mean the $1.41 per ounce and 0.34c per pound [exploration costs] will be improved upon, we will find the next one faster, cheaper and more efficiently, with less disturbance than we did at Alpala. MJ: Any surprises coming in the PEA based on the current understanding of how the project would look? NM: Yeah, it's going to be bigger than we thought. The high-grade core has doubled, it's still got more to go. That dictates that we probably want to be looking at making the project bigger rather than smaller. It's definitely going to be an underground operation, and as much block caving as possible from an operational point of view, because any time you can use gravity as your mining technique, your crushing technique and part of your milling technique, because the stuff autogenously mills in the cave as it falls down. That's great for your opex. The little bit of crushing and milling we have to do will be helped along by nice cheap hydro power that comes from a big grid only 30km to the east, from a capex point of view, we don't have to build a port, a sealed highway, a desalination plant, power station, pipeline and powerline. It's all there. The capex here is around about half of what it might have been if we were developing up on the Altiplano in northern Chile. On top of that, it's got a lot of gold in it, and on top of that it's got high-grade core. That core will enable us to get this going with relatively low capex. MJ: You've previously said you could build it yourself - does increasing the scale mean you need some help? NM: No, it just means we'll need to have a bit more financing for the mine development. We'll never, ever be JV'd. To come back to my original mantra about doing this for shareholders, I'm a shareholder, heavily invested in it, most geologists only get an opportunity to work on one project like this in their careers. We've got an opportunity to work on 12 of them. There's no geological reasons why the other 11 can't be as good as the first one. I think you'll find privately that's one of the things that interest BHP. That's an entirely speculative view, but if I was them that's what I would do. Dealing with BHP was a pleasure. It took three weeks from the first phone call. MJ: Did they have a better understanding of how you operated, compared to 2016? NM: Yes, and the way they do business has radically changed. MJ: So their capital allocation plan released this week, with earlier stage, potentially higher-risk investment, was quite familiar to you? NM: Yep. They understand what porphyry systems are, they understand how recognisable they when you first drill into them. We've got 70 drill holes that all have between 500 and 1500m of intersection and it covers a big footprint. You can muck around the edges about what it's going to deliver. But they know what it's going to deliver.